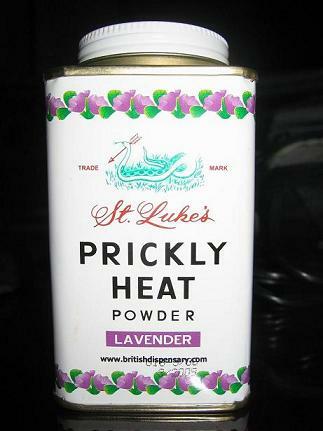 Prickly Heat Powder… in lavender! A few days ago I had an awful case of heat rash! My armpits, my thighs, that bit on the opposite side of the elbow, underneath my…. boobies (hehe) were all red and sooooo itchy. Apparently I sweat a lot during a camping trip early January and I and it wasn’t exactly windy in the camping site. So combined all that with Brunei’s ridiculous humidity I was as raw as beef carpaccio. But lo and behold, a Prickly Heat Powder had been invented! More than 60 years ago! And best of all, available in a lovely, non-medicine-y lavender scent. Have you tried the Prickly Heat Powder? Which colour do u like best? Ive only ever tried the red one. Haha. Hi from a silent reader! I am curious as to where you got the lavender version? Hello silent reader! I bought in Huaho Tg Bunut but I assume all the Huahos will have the powder. Nice smell better than red/green/blue which are quite medicine-y. Good luck! prickly heat really helps me go through this itchiness. yay!